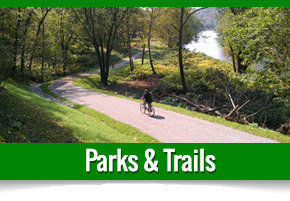 Indiana County Parks & Trails is a natural resource-based park system located in west-central Pennsylvania. We operate 2,700 acres of parks, natural areas and historic sites along with an extensive regional trail system. We offer year-round facilities and activities for your use and enjoyment including an extensive environmental education program series. 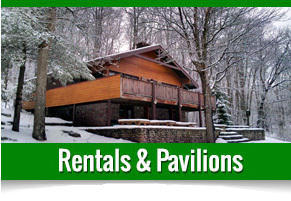 Visit our rental facilities page to find the right facility for your next event or special occasion. Our county parks and trails offer the chance to play, relax, improve your health and fitness and explore the natural world. 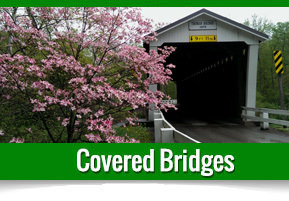 We encourage and invite you to discover Indiana County Parks & Trails! 2019 Friends of the Parks Schedule now online. Visit the Friends of the Parks page on this website for a complete list of this year's programs. Buttermilk Falls is located at 570 Valley Brook Road, New Florence, PA 15944. The site is open daily from 8 am to sunset. We are now accepting donations at the site. Please consider making a donation to lend your support.